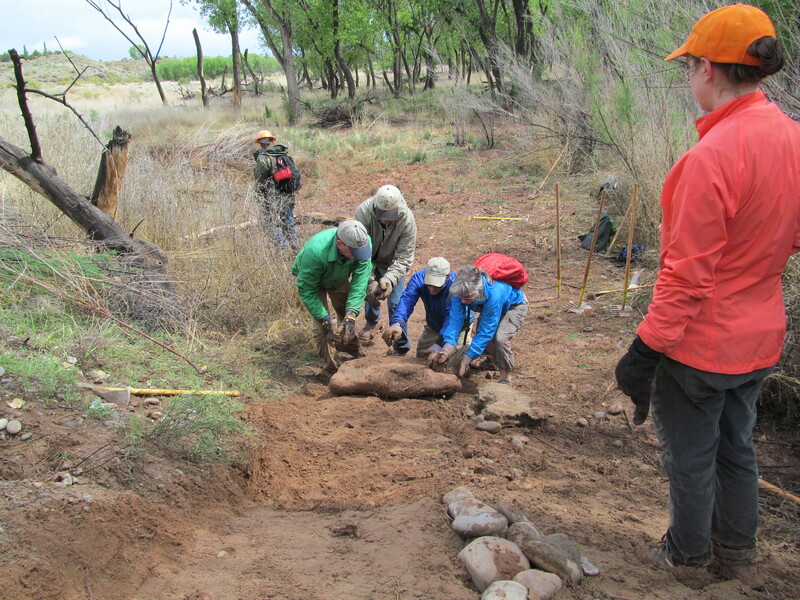 Thanks to the New Mexico Volunteers for the Outdoors, Coronado Historic Site has a new trail that goes into the Bosque. On Saturday May 16th, the volunteers cleared the vegetation to create a path down off of the bluff that the site sits on into the floodplain where the river flows. they cleared a large amount of salt cedar and moved some pretty large rocks to create the path. The photographs look especially lush because we were caught in an hour-long rain storm at the beginning of the project. Many of our volunteers left covered in mud! Now our visitors can explore the bosque, and this new trail will be especially exciting for bird watchers and nature lovers! Tags: Bernalillo, Bosque, Coronado Historic Site, Hiking, Nature, Nature Trail, New Mexico, New Trail, Ranger Ethan, Rio Grande, Sandia Mountains, Sandias, Southwest, Trail. Bookmark the permalink. This, and the other posts, are awesome! I’m so happy to see all that is coming together for Coronado! Thanks to all the rangers and volunteers for making this happen!! !